If you have been following this blog than you know that I have started running. 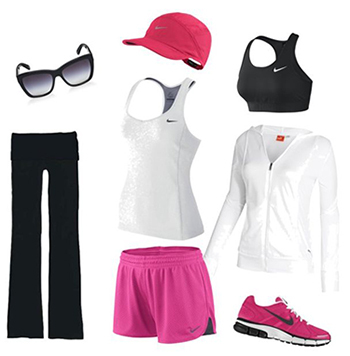 I went out and purchased myself some running attire to help me succeed and feel good while running. You will need a few things to run in comfort. First thing’s first. If you don’t have a good pair of running shoes you will need to splurge and buy yourself some. You will want a supportive pair that is very comfortable and fits well. You will also want a nice pair of pants or capris to run in. I prefer to wear tight yoga capris or pants as I find them the most comfortable. You may also want to get yourself a pair of shorts for warmer days. I found these cute pink shorts made by Nike that I really like. Make sure they are comfortable and do not ride up or fall down while you are running. You will also want to get a comfortable fitting tank top or t-shirt. I prefer tank tops as short sleeves tend to bother me. You could go for either a tight fit or loose fit top. It all depends on what is comfortable for you. I also purchased myself a lightweight training jacket for when it is cooler outside. I tend to run in the morning or late at night when it is cooler out. I really like Adidas’ training jackets, look for one with breathable material as you may get hot while running. Don’t forget to get yourself some hair ties. I always put my hair up in a pony while running to keep it out of my face. You do not want any distractions. You may also want to get some sunglasses and a hat for sunny days. I usually run with my sunglasses on so I don’t end up squinting if it gets sunny. You should always protect your eyes and prevent wrinkles. Don’t forget about getting a good sports bra for support. You want to make sure you make running as comfortable as possible for yourself. I hope this helps you with finding the proper clothes to run in or do any kind of exercise.